Hey, I was wondering if anybody would like to put pictures of their custom star wars figures. Once i figure out how to use my camera , I'll put in my own. But in the meantime submit your pictures if you can. I do believe there are a number in the gallery, and there are bound to be a bunch floating around in this section. Take a look around and see if you can't find some you like. I know I would love Star Wars 'scape and have quite a few ideas for it. I haven't put them into cards as of yet, but I have converted as many regular Heroscape abilities as possible for Force users. I just pulled this out of my behind. The thematics may be off, as I've never seen Star Wars, but from my basic knowlage of it, this should be about right. Force Mastery is a homage/rip-off of Gift of Magic. 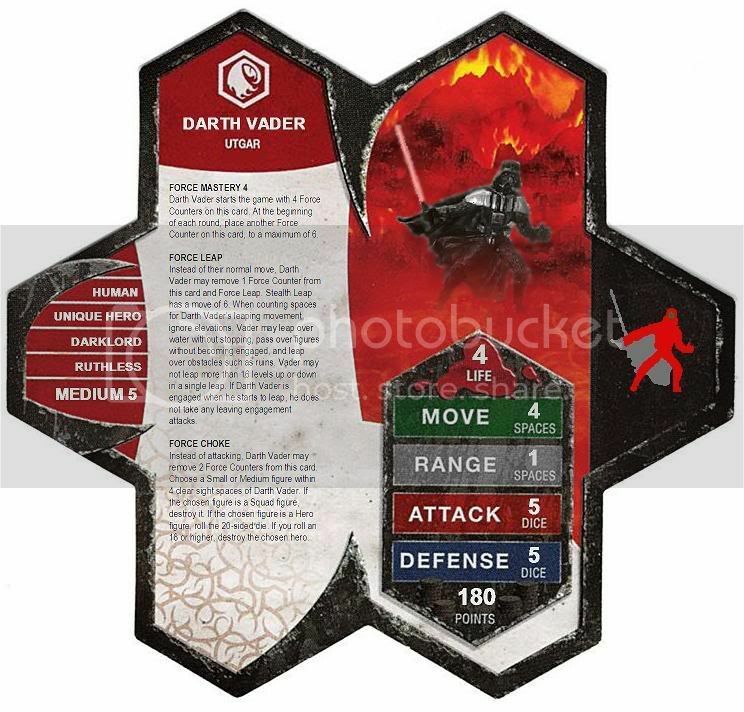 Darth Vader starts the game with 4 Force Counters on this card. At the beginning of each round, place another Force Counter on this card, to a maximum of 6. Instead of their normal move, Darth Vader may remove 1 Force Counter from this card and Force Leap. Stealth Leap has a move of 6. When counting spaces for Darth Vader’s leaping movement, ignore elevations. Vader may leap over water without stopping, pass over figures without becoming engaged, and leap over obstacles such as ruins. Vader may not leap more than 16 levels up or down in a single leap. If Darth Vader is engaged when he starts to leap, he does not take any leaving engagement attacks. Instead of attacking, Darth Vader may remove 2 Force Counters from this card. Choose a Small or Medium figure within 4 clear sight spaces of Darth Vader. If the chosen figure is a Squad figure, destroy it. If the chosen figure is a Hero figure, roll the 20-sided die. If you roll an 18 or higher, destroy the chosen hero. Could someone tell me how to put an image from microsoft publisher into this Thread, because i would put my customs in, but i can't figure out how. You need to save from MS Publisher as an image (gif, jpg, or png), then upload that image to a website or picture hosting service, and then post the link to that.